Family time. Those two words can conjure up smiles or the rolling of eyes. We can’t change the personalities in our family, but we can work toward close relationships and connections with one another. Family time is one of the best ways to do that. In fact, I’d say it’s crucial for building a strong home. It’s so easy to get caught up in the busyness of life and everyone seems to be going in different directions. I get it. But if you desire to have a close family, you must spend time together. You have to make it happen. It might feel weird or awkward at first, especially if you have older children who aren’t used to the family closeness. Just hang in there, it will get better. 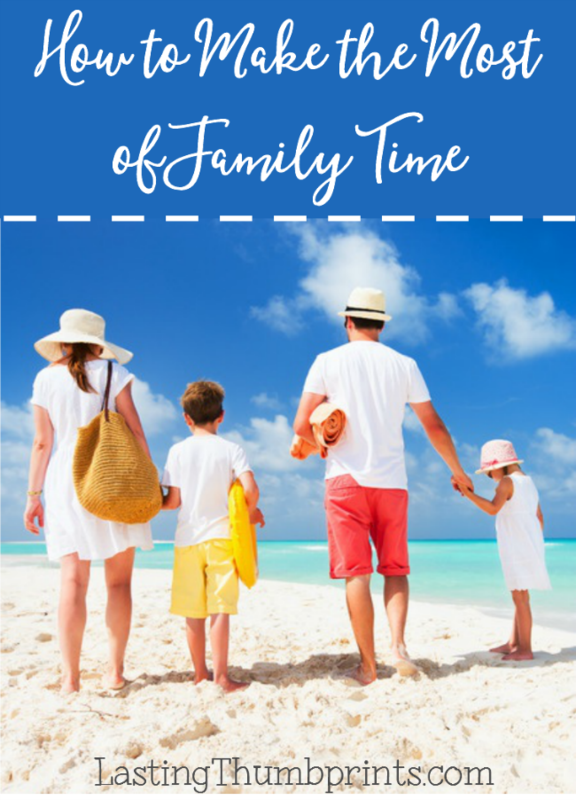 If you’re not sure what to do, here are a few important tips for making the most of family time together. Don’t worry about anything else when you’re with your family. You need to be able to focus on them, not on a to-do list or anyone outside of your family during this time. Turn off your phones. Shut down the computer. I promise it will all still be there when family time is over. When it comes to making the most of family time, be sure you have a least a basic plan. Pick a day and time that is free for everyone. Add some buffer time around it, so no one is distracted if they need to be somewhere else later. Having a plan will keep things moving and will alleviate stress. Your plan doesn’t have to be elaborate or a involve a rigid schedule. In fact, I don’t recommend that at all! A complicated plan can keep you from enjoying your time together. Don’t overthink it either. Family time is just that, a family spending time together. Keeping it simple will help you be able to relax. Try to pick things that everyone will enjoy and can participate in. If you have a hard time coming up with an activity that the whole family will like, you can always rotate activities based on each family member’s interests. This can go a long way in developing family connections. Finding ways for kids to give their input into family matters is important. Family time is a great opportunity to give them a say. In fact, while the adults can be busy wracking their brains, the kids always have fun ideas for spending time together as a family. When you let the kids have a say-so, it adds a fresh perspective and makes them feel invested in your family. Another great way to better family time is to actually switch it up. While it doesn’t matter what you do, it’s still a lot more fun to change things up a bit. Kids and adults get bored easily, although the kids will admit it before the adults do. Need some ideas? Here’s a list of 100 family activities to help. When it comes to quality family time, how do you make it more awesome? Leave your tips below! If you’d like more tips and encouragement for building a strong home and happy family, sign up below for free email updates including exclusive content and freebies.